Thank you for your love and support this week. As the co-organizer of Social Media Week Toronto (Feb 1-5, 2010), I had the chance to meet so many wonderul people In Real Life, via Twitter, via email, etc and to take part in the creation of over 35 events about social media and how it influences our lives. It was such a brilliant week, filled with so much great energy and so many lovely people – participants, peers, panelists. I am behind in @replying, in emailing, in writing for this space and will catch up slowly in the days to come. 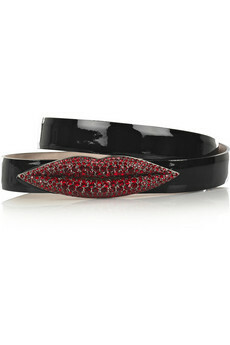 In the meantime, I send you all mass love – and a big fat crystallized kiss, courtesy of Mr. McQueen. MWAH! McQueen lip belt from FW09. You can find out what happened – one tweet at a time – via #smwto on Twitter. I’ll, of course, have a recap of the Architects of Community and Having @Style panels later this week.